The morning of the 1st January 2010 appeared bright and very very crisp. There had been a hard frost with temperatures dropping to minus 3 over night. But, there was a cycle ride to do on New Year's Day. The day was too sunny to miss a cycle run and the wind had dropped. The mountain bike girls were meeting in Ramsey for a mtb ride in the North of the island, but as my mtb is still in the shed with seized brakes, I was unable to make their ride sadly. But, as I am very used to entertaining myself when it comes to cycling, New Year was to be no exception. 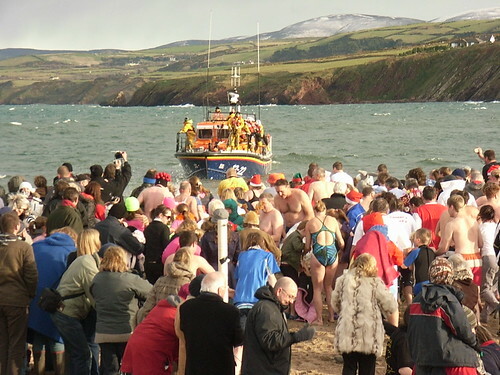 Besides, in Peel on New Year's Day there is entertainment to be had in the shape of the Peel Bay New Year Dip to raise funds for the RNLI on the Island. 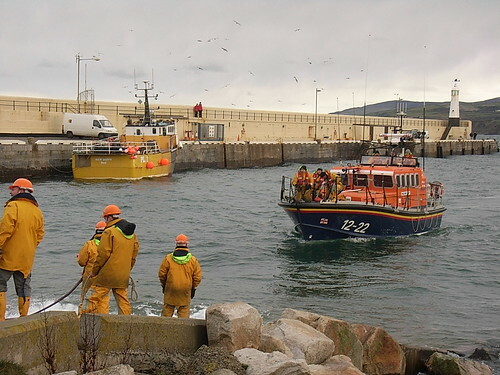 The RNLI started out its origins on the island, and it is heavily supported here, as it is by many fishing ports and maritime villages throughout England, Scotland and Wales of course. I awoke later than I expected to, and it seemed to take ages to get into the layers and layers of cycle kit one needs during this time of year. 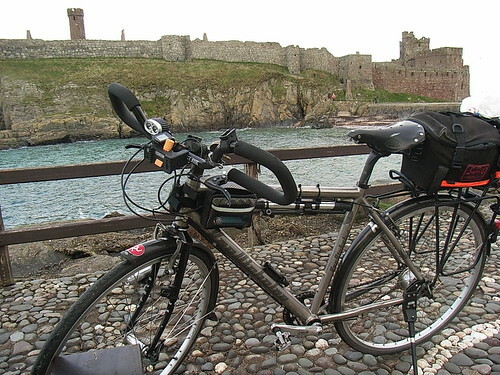 I set off, and cycled very gingerly towards Peel. Peel is about 16 miles from home taking the main routes, which were the well gritted roads, so instead of the long way round, ie the more pleasant and scenic route to ride on a bike, I instead took the busy direct route. Unfortunately so did everyone else, and once I reached St John's it was a case of all roads lead to Peel regarding traffic, and as the sun had not reached my side of the road, I ended up cycling on the icy bits of it, with the fast cars not leaving me much room. I was very lucky though, although I did not enjoy this part of the ride, I stayed on and upright on the bike, and didn't fall. Peel was bedlum! Cars everywhere, parked anywhere and what seemed like most of the island had turned out on this really cold day, to watch others do even colder things. 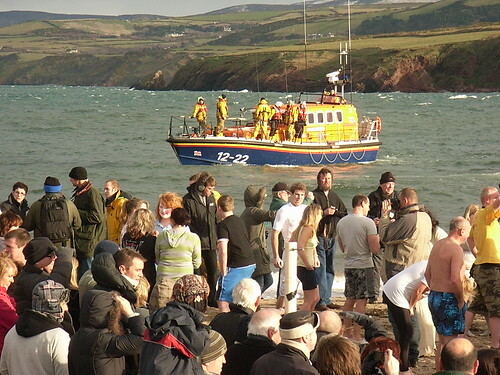 The Peel Dip has become a bit of a regular charity event on the island and gets a lot of support from the locals. 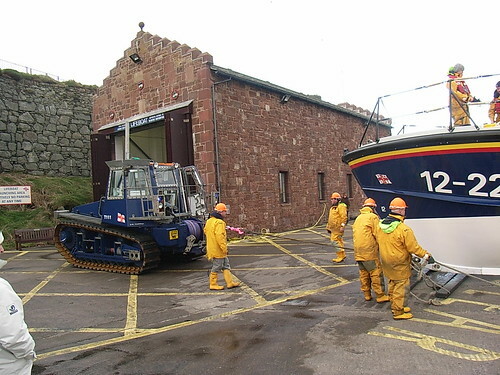 Most of the dippers were in fancy dress, and the RNLI boat was of course close to shore incase of any drownings or other such catastrophies. It was freezing cold. Im afraid, I was somewhat far back from the front of the crowd so missed many of the dippers, but hopefully some of these pics give you an idea of the carnival atmosphere of the day.. I had just cycled 15 miles, and I managed to arrive 10 minutes before the plunge, so you would think my warmth would of held out, but standing with the other locals, my teeth were soon chattering, and my feet were slowly losing their connection with the nerves in my legs and going numb. Just talking to those around me was difficult as my face was so cold, so what this lot must of felt like.... Boy what a way to raise money. 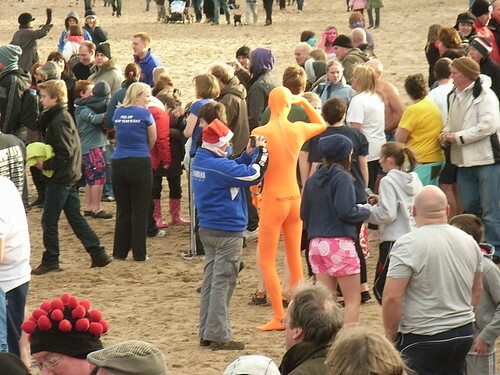 The plunge took place at noon sharp with the RNLI boat sending off a flare, soon the beach was full of screaming, running, strangely dressed, slightly mad individuals who had yet to meet such a cold start to their New Year. It didnt take long.... 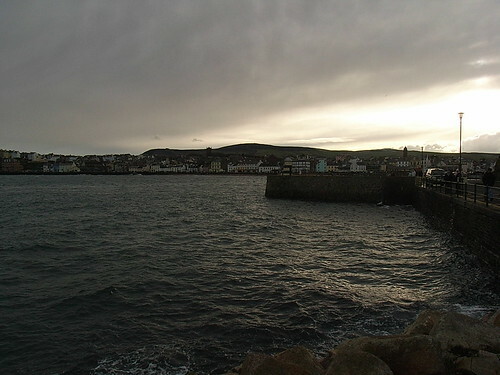 Soon wet bedraggled folk were getting wrapped in blankets as they emerged purple and blue from the icy Irish Sea. A few fools took the opportunity for a bit of a swim, but even they emerged in a short space of time. Bodies shrivelled and in several shades of megenta and pink on bare tortured arms and legs stinging from the icy waters. The beach started to empty out as fast as it had earlier filled. 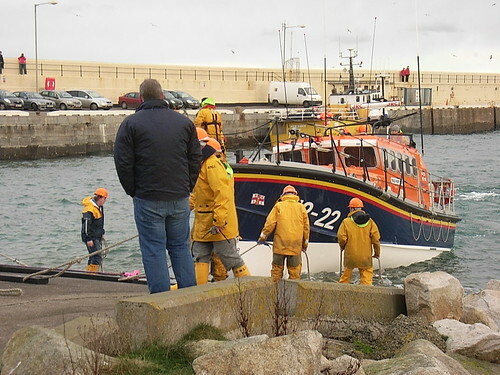 I took the bike round to the Castle to take a few shots of the bay looking over the town of Peel, and took these pictures of the RNLI lads bringing into shore their seaworthy mount for the day. I didn't want to cycle home immediately to let the traffic find its way out of the town first. I finished my coffee and the last of the Christmas biscuits on Fenella Beach before setting off for home. I was so cold by this time that getting my camera closed and packed on the bike was very difficult, but once the legs were turning, and life returned to my feet I was soon pedalin' homeward and looking forward to a glowing fire in the front room and a hot coffee. Happy New Year to everyone, to one and to all, here is hoping your health remains strong, and that your legs are spent cycling and turning those pedals for 2010! Posted by Mary on January 1st, 2010. Happy New Year Mary! 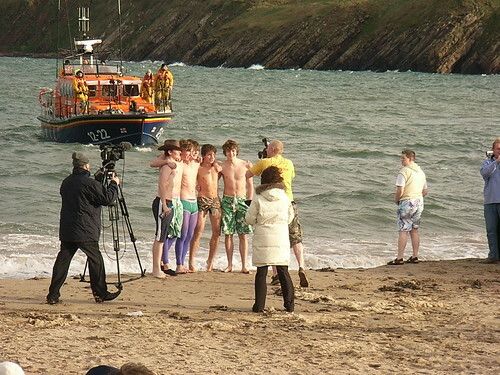 Those crazy midwinter-sea-dipping Manx people were on the UK national news today. Your pictures capture the same festive atmosphere that came over on TV. All the best for 2010. Mary, you've the same rear bag as I currently have on my tourer and much the same bars, but how do you grip them when you stand up? I've mine set flat, with the front inward-projecting bits sawn-off, to accommodate a handlebar bag. I find them brilliant as I have a small non-healed fracture at the base of my thumb which makes it painful to grip drop-bars while standing. I've an American book of short articles about the outdoor life written by an American Journalist, which is very funny. In one he descibes how he and a pal went skinny-dipping in a lake in the back of beyonds, miles from human habitation, but as happens, no sooner were they in the water than a party of schoolgirls came along and started a picnic between them and their clothes. When they no longer could stand the cold they decided to run for their clothes. He observed. "They appeared to be completely unaffected by our running past them and obviously thought that we were wearing blue leotards!" Garry, I solve the problem by never standing up. I must admit standing up and pedalling has never been my strong point. So I choose low gears, sit and grind up all the hills. I only use my bar bag when I am touring or Audaxing. Until I discovered the smaller bag, I have attached to my top tube. Its the business, can be removed fast and easy, is light to carry but just big enough for my money, camera and phone. Bought from Active Leisure UK. Been a god send when out on mtb for a long time and I need snacks too. Mary wrote: I solve the problem by never standing up. Me too. I'm definitely a low gear grinder. I mostly sit down but stand now and again. One of my friends stands up 50% of the time, even when on the flat. He's always had that habit. Mary's photos off our Flickr account look good, I think. Flickr does a great job of keeping the images sharp when they're reduced in size for blog pages, and also keeping file sizes down. I'm very impressed. I've just opened a new account in my own name. I've tended to build my own image galleries in the past, on my hosted server, but I'm moving to Flickr for my personal photo galleries.